I’ve been running an APRS RF-to-internet gateway for a few months now. It uses javAPRSSrvr as the gateway program and soundmodem as a soundcard modem, both running on a remote Linux machine. Both programs are very reliable, running for months without a fault. I spent a bit of time trying to get the two programs to communicate over a virtual serial port, but this did not work, so I eventually switched to AX25 kernel-mode support, which worked out of the box on Ubuntu Linux. I want to track myself using APRS, so I needed a tracker.There are several published hardware and software designs on the Internet, and I originally considered building a tracker based on one of these designs. But I eventually decided to build a tracker that is not based directly on any existing design. Mostly, I wanted to end up with a high-quality and flexible code that could be easily ported to different hardware platforms and to different uses. I’m not yet there, but I’ve got a working prototype that’s running my own code. One thing I knew I wanted to do was to avoid a modem chip. Some APRS trackers and digipeaters use a modem chip, normally the mx614. A modem microcontroller would be able to produce and decode a 1200b/s AX25 signal in software. There are several trackers that do that already, like Gary Dion’s WhereAVR and Byonics‘ TinyTrak3 and TinyTrak4. The prototype is running on an microcontroller development board that I use at work for teaching a course on embedded computing. It has an LPC2148 microcontroller, which has an ARM processor, and lots of on-board peripherals. The tracker currently uses almost none of the on-board peripherals except for the LCD screen. 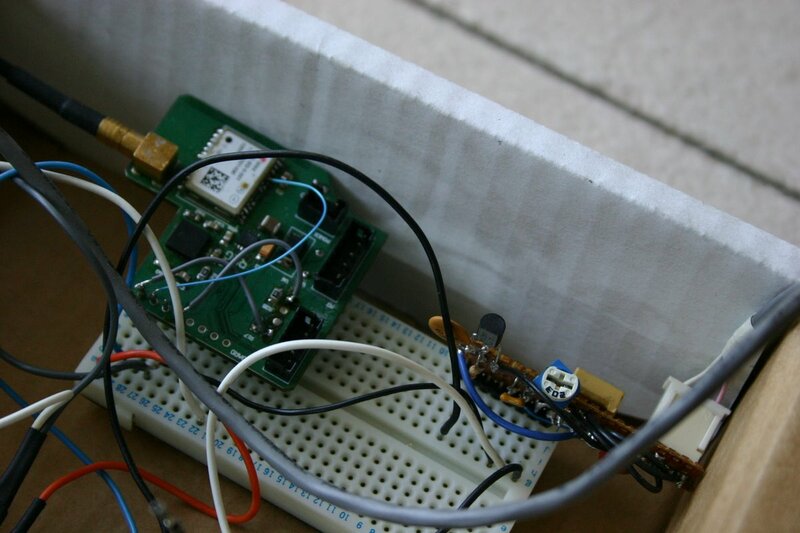 The board is connected to a GPS module and to a VHF radio. The GPS is a NEO-5Q module from ublox; it’s mounted on a board that also has a microcontroller and a bunch of other components (a prototype from an old wifi-based tracker project I participated in), but I’m only powering and using the GPS module on this board. 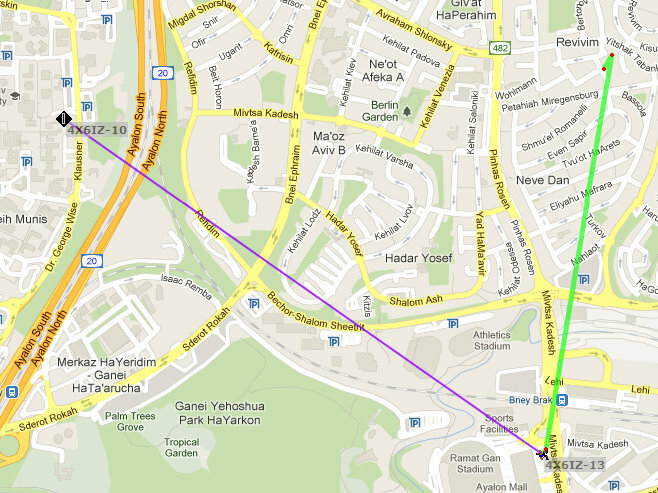 The GPS is connected to an external active patch antenna. The radio I’m using is a Baofeng UV-3R, which I bought mainly for this purpose. It cost less than $50 including shipping, considerably cheaper than some dedicated VHF tracker transmitters. 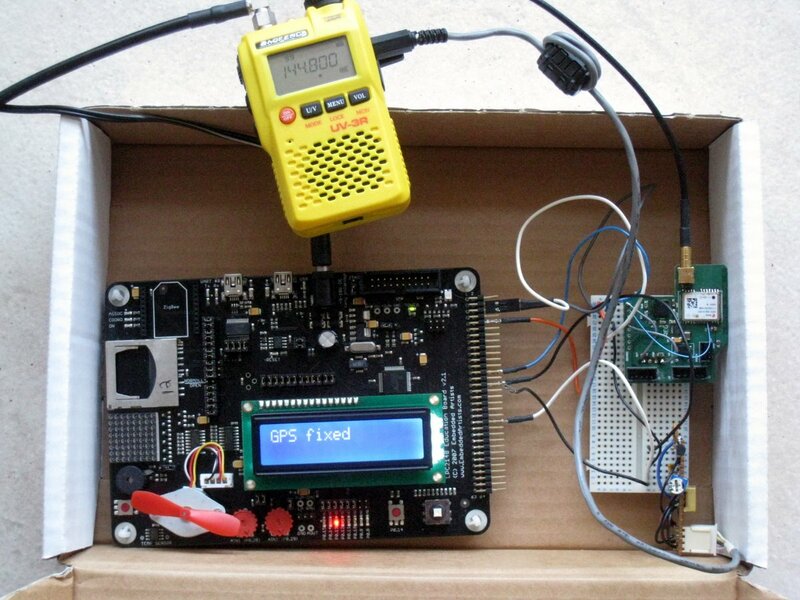 The radio is connected to the microcontroller through a little interface board that I built. Both this interface board and the GPS module are currently stuck into a breadboard, with wires connecting the microcontroller board to the breadboard. The interface board performs 3 functions. It connects the DAC output of the microcontroller to the microphone input of the radio. This signal is routed through a trimmer resistor, to adjust modulation in the radio (it needs a much smaller amplitude than the DAC produces), and though a DC blocking capacitor. The board also routes the audio output of the radio to an ADC pin of the microcontroller, but I haven’t tested this yet. Finally, an open-collector NPN transistor switches the radio to transmit. I had some trouble with this transmit-receive switch: RF would get into the circuit and would keep the radio transmitting long after the microcontroller tried to turn the transistor off. I solved this with two 0.01μF decoupling capacitors on both the base and the collector of the switching transistor. I used my own software drivers for the microcontroller (for it’s UARTs, DAC, etc. ), but I used code from other APRS open-source projects for building up packets and for producing the audio output of the modem. I will release the software once it is more or less stable. I used three codes: Tracker2’s code by Scott Miller of Argent Data, the AX25 code in BeRTOS (a real-time operating system), and soundmodem. I have a lot of positive experience with soundmodem running on the Linux box, so hopefully it will work well on an embedded system. Fortunately, it uses fixed-point arithmetic, rather than floating point which is not supported in hardware on small microcontrollers, so it should work. But I have not tested the demodulator yet. The parts of soundmodem that I’m already using required quite a bit of hacking, unfortunately. I initially tried to keep the modem code as is, but I gave up after a while; the over structure does not work too well in an embedded setting. I’ve been working on the tracker for a few days, and yesterday it got to the point where it was working on the bench: parsing GPS data, producing packets, and sending them to the radio. The packets were well-formed and my gateway decoded them (actually just some of them; I’m not sure if the 2W signal from the radio was too weak, or the transmitted audio is not good for some reason). It was time to take the tracker for a ride. I took it to the car and hooked it to the cigarette-ligher’s socket. The LPC2148 board can be powered by up to 15V, and it can produces enough 3.3V power for the GPS, so I assumed everything would work. It did for a while (you can see some position spots in the aprs.fi map on the right), but after a few minutes the tracker started rebooting itself every second or so. I touched the regulators on the board and they were pretty warm, so I’m assuming that one of them overheated, shut down, and caused the system to reset. I guess I can’t power this unit directly from the car’s battery; I’ll need to drop the voltage with an off-board regulator first. Next, I’m going to work on the AX25 demodulator, hopefully producing a tracker that can also decode packets.